Kids Vinyl Chair. Available In Black, Red, Blue, Red and Baby Blue. Not Available In White. 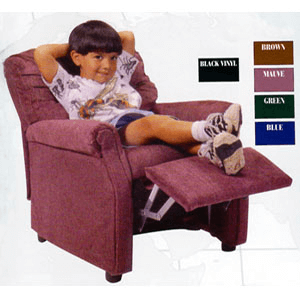 Size: 25 x 22 x 22 H.
Natural Finish Relax Chair with Multicolor Fabric Cushion Seat. Dimensions: 17 1/4 L. x 19 3/4 W. x 26 H.